Although many people associate orthodontic treatment with adolescence, surprisingly nearly one quarter of all orthodontic patients are adults. The cumbersome and conspicuous wires and brackets of traditional braces most likely cause hesitation in other adults who might benefit from orthodontic treatment. It is with these people in mind that The Silverstrom Group proudly offers the Invisalign® system, an extraordinary alternative to metal braces. Invisalign® uses a series of clear plastic aligners to gently guide teeth into their proper position, based on a careful analysis of a patient’s current bite with relation to his or her ideal bite. Treatment requires roughly the same amount of time as that with traditional orthodontic appliances, and produces equally impressive results. 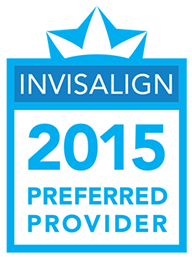 Invisalign® has distinguished the practice as a Preferred Provider because they have achieved a significantly high level of experience treating patients. Invisalign® gradually shifts teeth over a period of several months to two years, all designed through the use of computerized dentistry. After a thorough examination of your teeth and gums, an impression will be taken of your teeth and sent to the Invisalign® laboratory. The laboratory technicians will use advanced three-dimensional computer imaging to create a series of aligners based on this impression and the specifications provided by our dentists. Each custom-manufactured aligner in the series will move your teeth closer to their ideal position within your mouth. You will replace the aligner you are wearing with the next in the series roughly every two weeks. The aligners are virtually invisible when worn and very difficult to detect, even upon close inspection. Aligners can be removed during meals so that hard, crunchy foods that might be off limits for wearers of traditional braces can be consumed with ease. Aligners can be removed for brushing, flossing, and professional cleanings, making it easier for patients to maintain good oral hygiene during treatment. If you are a teen or an adult with poorly aligned teeth, crowded teeth, unevenly spaced teeth, or an overbite, you may be a suitable candidate for Invisalign® treatment. The aligners are particularly effective in correcting cases of mild to moderate misalignment.